Why do people hate mathematics ??? In 2009 I wrote Elegance with Substance (EWS), discussing both better education in mathematics and the political economy of the mathematics industry. See the available PDF. Check also Steven Krantz Through a Glass Darkly at arXiv 2008. The dismal state of mathematics education is generally acknowledged, essentially since Sputnik 1957. People have tried all kinds of solutions. Why do those solutions not work ? Mathematicians are trained to think abstractly. Education is an empirical issue. The courses for becoming a math teacher don’t undo what has gone wrong before. When abstract thinking math teachers meet real life students, those math teachers solve their cognitive dissonance by sticking to tradition: “School Mathematics” (SM). School mathematics isn’t clear but collects the confusions and wreckages of math history. Thus we need to re-engineer math education and reorganise the mathematics industry. One idea is that education would use the form of the Medical School: both practice and research. EWS contains various examples where traditional math is crooked instead of clear. One example is that “two and a half” means addition and should be denoted as 2 + 1/2, but is denoted as multiplication or “two times a half” or 2½. There is a collective failure w.r.t. the integrity of science, in that Research Mathematicians step outside of their field of expertise (RM) and make all kinds of unwarranted claims about Education in Mathematics and its research (EM). This aggravates the observation above that the conventional EM is lopsided to SM. It is also a breach of research integrity that the warning in EWS is not responded to. When it is shown that the brakes of some kind of car don’t work properly, it should be recalled – and the same for EM. This especially holds in Holland. In Holland there is even explicit fraud in EM. For the UK there is some worry, see my 2014 paper Pierre van Hiele and David Tall: Getting the facts right. For the USA there is now the worry concerning professor Edward Frenkel. Pierre van Hiele (1909-2010) was the greatest analyst on mathematics education of the last century, with his main thesis in 1957, coincidentally with Sputnik. However, his analysis was maltreated by Hans Freudenthal (1905-1990), who stole Van Hiele’s ideas but also corrupted those – partly claiming his “own” version but without proper reference. Van Hiele looked at the angle of abstract versus concrete, while Freudenthal turned this into model versus reality, which is didactically rather absurd, but which apparently appealed to policy makers after Sputnik 1957. Holland now has a 95% dominant “Freudenthal Institute” that rather should be called the “Freudenthal Head in the Clouds “Realistic Mathematics” Institute”. Apparently, the Dutch RM and EM community is unable to resolve the issue. Internationally, IMU / ICMI (see my letter) has a “Freudenthal Medal” honoring the fraudster. A leading analyst in the UK is David Tall (b. 1941) who rediscovered the importance of the Van Hiele analysis, but erroneously thinks that Van Hiele was not aware of what he was doing, so that Tall claims the discovery for himself. Part of Tall’s misunderstanding of the situation is the consequence of Freudenthal’s abuse of Van Hiele. Professor Tall should however quickly bring out a revised 2nd edition of his 2013 book to set the record straight. I have discussed some of Frenkel’s ideas. As he hasn’t studied math education empirically, he is not qualified to judge, but he follows the RM arrogance to think that he is. Well, hasn’t he passed through the educational system himself ? Isn’t he teaching math majors now ? These are hard fallacies to crack. Numberphile has a 9-minute interview with Frenkel, asking him: “Why do people hate mathematics?” I leave it as an exercise to the viewer to identify the amazing number of delusions and fallacies that Frenkel mentions in this short time. Perhaps shortness invites imprecision. However, check this weblog’s texts of the last week, and see that these delusions and fallacies are systematic. Just to be sure: debunking those delusions and fallacies may not be easy. If it were easy, the state of math education would not be as dismal as it is now. The beauty of art is abused again. Math education would teach you painting fences but not the appreciation of the great results of mathematics. To some extent one can agree. Math history and some encyclopedia of math are very useful to have. But art education is not intended to get people to make masterpieces. Mathematics education is intended to help students develop their understanding and competence. These are different settings. 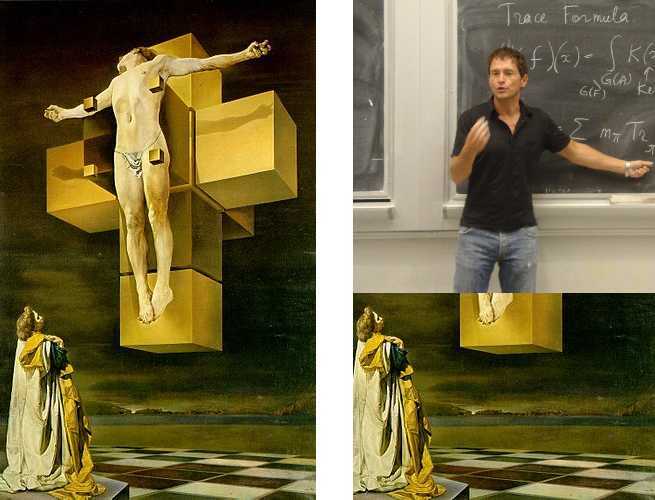 Frenkel claims that everything is based upon the language of mathematics. “In a way one can survive without art. No one can survive without mathematics.” Since abstraction means leaving out aspects, it should not surprise that if you start with the world and then abstract from it, then your results may indeed be relevant for “everything”. But you cannot infer from such an abstract position that people should love their math education. He again is in denial of the role of mathematics in causing the economic crisis. The problem is often stated in the terms of “people hate mathematics” in a manner that is not linked to mathematics education. As if there are two kinds of people, mathematicians and other – the elite versus the peasants. But the true problem is mathematics education. Math teachers have their students for some 12 years as their captive audience, and manage to turn human innate interest into said hate. By stating the problem in terms of some vague “general audience” it becomes easier to run away from the responsibility staring you in the face, and the destruction of human lives going on in the classrooms around the world. Okay, so, Frenkel takes the blame. But there is no consequence. No reduction in salary. No prison term – with use of the library to start studying mathematics education. Just the burden to go out into the public and become a media star by comparing mathematics to Van Gogh, Picasso, and what other artist that can be abused and intimidated into an admiration for mathematics that they don’t understand but generally hate. In minute six he says that the math teachers are not to blame. “They are overworked and underpaid” and “products of the same flawed system”. Thus, the idea that grown-ups should take responsibility for what they are doing, and that professional educators have an ethic to live up to, is flushed down the drain. Jesus absolves the sins of those who believe in him. The topic of discussion is reduced to “beauty”. This will generally concern topics that require an advanced university degree to understand – and that conventionally are presented in a confused manner to the general public (see yesterday). PM. The link of Jesus to a scape-goat is no coincidence. December 25 falls in the sign of Capricorn and Jesus was sacrificed as the Lamb of God. See “The simple mathematics of Jesus“ for a discussion that the Bible is an astrological book – and, if you didn’t know, that astrology isn’t science. I am sorry to report that Holland also fails on the integrity of science in the research on the didactics & education of mathematics. This is my letter (in Dutch) to the Scientific Integrity body LOWI of the Dutch Royal Academy of Sciences KNAW. Earlier, in my book Elegance with Substance (2009), I made the empirical observation that mathematicians are trained for abstraction while education is an empirical issue. The training of mathematicians to become teachers of mathematics apparently can often not undo what has been trained for before. This basically means that many have lost the ability to observe. Math teachers tend to solve their cognitive dissonance by adhering to “mathematical tradition” that however is not very didactic, and that in fact collects the didactic debris of past centuries. A key example here in Holland is the difference between Hans Freudenthal as the abstract topologist and Pierre van Hiele who as a mathematician and actual teacher however kept his ability to observe. We need only look at the debris in math textbooks to observe that the majority of math teachers aren’t like Van Hiele. See Elegance with Substance if you cannot identify the debris yourself. An international example on statistics is the difference between Fisher and Gosset on “statistical significance”. Mathematicians tend to consider mathematical statistics only, and are little aware of empirical significance. Math educators who nowadays use statistics might fall victim to ‘garbage in, garbage out’ but nevertheless be praised as ’empirical’. Now in 2014 that empirical observation comes with a sting. When abstract thinking mathematicians make statements about the empirical reality of didactics & education, they actually make statements out of their province, about something they haven’t studied: which is a breach of research integrity. This especially holds when they have been warned for this, say by my 2009 book (listed in the AMS Book List, Notices Vol 58, No 11, p1474), or perhaps even directly by me. In Holland there now is the case of internationally known Jan Karel Lenstra, who did work in operations research, (linear) programming, scheduling and the traveling sales person, who was selected in 2009-2010 by theoretical physicist and KNAW President Robbert Dijkgraaf to chair a KNAW “Committee on Mathematics in Primary Education”. The Dutch complaint is that children don’t learn arithmetic so well anymore, e.g. aren’t trained on long division as a sure method. It often happens that a committee is chaired by a person who doesn’t know much about the subject beforehand, but then that person tends to be aware of this, and is willing to learn. In the case of Lenstra, he apparently thought that he knew enough about “Mathematics in Primary Education” so that he also understood the didactics & education itself. But Freudenthal and his followers did claim that ‘realistic mathematics’ was scientifically warranted and based upon evidence. Thus professor in mathematics Lenstra observes a fraud with respect to empirical research, but doesn’t do anything about it. He doesn’t call for a repeal and annulment of earlier “research” that claimed empirical relevance but without such base. He is quite happy that his fellow abstract thinking mathematician Freudenthal invented a theory and let others suffer the consequences. Lenstra is another abstract thinking mathematician who now thinks that he has solved a problem and then lets others suffer the consequence – like the international community that still considers Freudenthal’s work “research”. One might say that Lenstra’s 2009 KNAW Report and recent June 30 2014 KNAW conference presentation (my report in Dutch) aren’t quite research themselves but rather evaluations on educational policy. It may well be that Lenstra’s texts here don’t register under scientific integrity in a strict legal sense, even though Parliament regards it as scientifically warranted. In another respect, Lenstra’s case is just an example, and it is a collective problem that abstract thinking mathematicians expound about empirical issues that they haven’t studied. Hence, my letter to KNAW-LOWI suggests a general exploration into the issue, so that the scientific community grows aware of the issue. Hopefully the specific issues on Freudenthal and his Institute are taken along, as explained here. 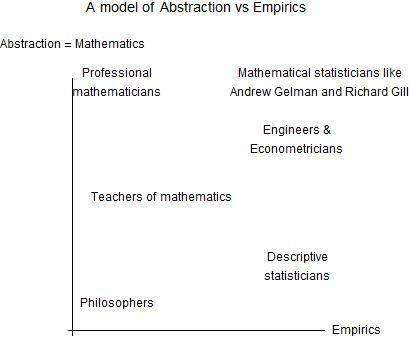 Above mentioning of Abstraction vs Empirics might cause the idea that those would be opposite, but these are rather separate axes. We might score the different professional groups on the study hours in each category, with mean and dispersion. I mention two example individuals for lack of an accepted term like “empirical mathematical statistics”. Since teachers teach they aren’t in research like other professions. 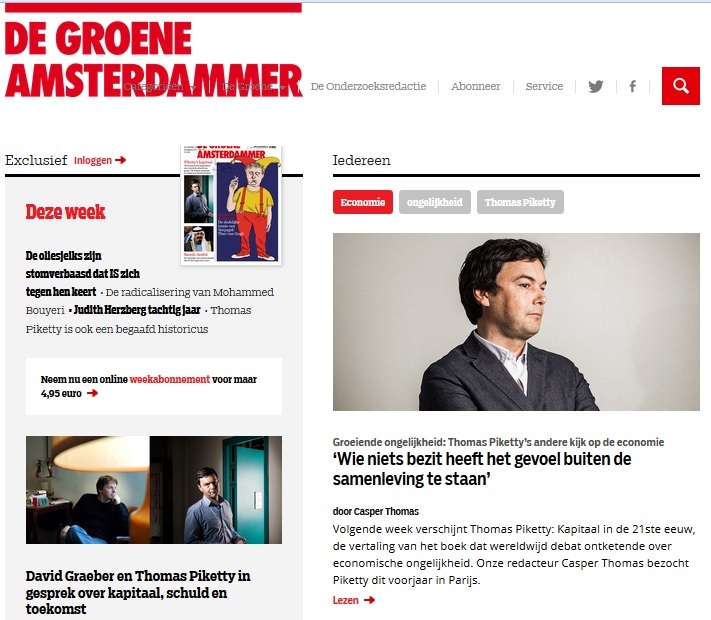 This weblog concentrates on failure on integrity within Dutch economic science, with the case at the Dutch Central Planning Bureau (CPB) concerning economic co-ordination and the example of unemployment. That censored analysis is relevant for the current crisis in the European Union, and for economic recovery in the United States, and for economic policy in the “emerging markets” too. 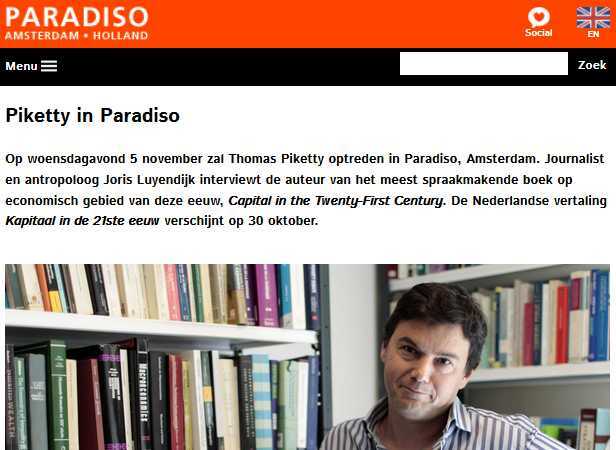 My advice is to boycott Holland till the censorship of economic science here is resolved. KNAW-LOWI cannot officially tackle the case since its mandate concerns universities while the CPB falls directly under the national government. But now there is a breach in integrity in research in math education as well. I have two academic degrees, one in econometrics and one in teaching mathematics, and it is disappointing to observe that my degrees open up to vista’s of non-integrity. It might soon become a personal thing. But, as Art Buchwald would advise us: while there is a whole country to blame we might as well take a look at the facts. And boycott that country till they get their act together. The world chooses to use English rather than Dutch or Latin, and hence we fall in the Dutch language sink again. As my letter is in Dutch, we might need to look to whom in Belgium, South Africa or Suriname still understands the gibberish. I presume that the people in New York (“New Amsterdam”, if they only knew) would need a certified translator. There might be some expats living in Holland who have learned some Dutch but I am afraid that some issues are getting complex, and then even many Dutch people would not be able to follow things. Foreigners would have even more difficulty in understanding local conditions. Hence I am quite hesitant to translate that letter. For comparison on KNAW-LOWI, we may look at the US bureau for research in education, IES, and the office of research integrity ORI of public health, and then also the ethical codes of AMS and MAA. There are a lot of ethics to look into. But let us not forget about education itself, and thus let me also alert you to this issue of CF with Forty Years of Radical Constructivism in Educational Research and hope that they put students before method. Cross my heart: Before a few hours ago I hadn’t heard about the website WhoIsBigger.com. It appears to be a project by Steven Skiena of SUNY Stony Brook. He and his team rank topics and not just internet pages. I have been an admirer of Steven’s work since his combinatorica package for Mathematica that I use a lot, especially in my book Voting Theory for Democracy (VTFD)(2001, 2011). My admiration for Steven however isn’t total so I lost out on his other activities. I now can advise the short movie with him on that website. Independently, as a teacher of mathematics I looked at archeology, astronomy, astrology and the origins of Christianity to widen the classroom scope from numbers, functions and geometry with their application to gravity etc. to new topics that some students might find more appealing. This resulted in the book The simple mathematics of Jesus (SMOJ)(2012). 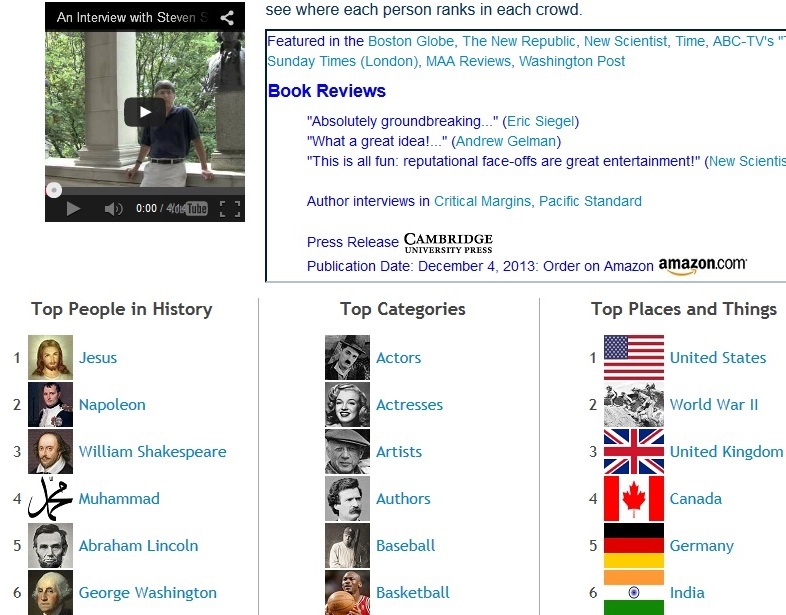 Punchline: Jesus turns up as number 1 in Steven’s list of “Top people in History”. Call it coincidence or a good intuition. Another case of this is that both Lincoln and Washington appear on the cover of Voting Theory for Democracy. I am a bit amazed though that Jesus is listed as a historical figure. There simply is no historical evidence. The evidence that exists suggests that his persona was created as a theologico-literary concept. It appears that historians do not apply proper scientific methods but they act as judges about history. They hide the uncertainty while scientists should emphasize the uncertainty. This weblog already has various entries on this: see for example the sieve of realism, the review of the book by Maurice Casey and the question what the probability is that a preacher has the name Jesus and is crucified. I may admit that I felt a bit awkward at times for spending so much attention to Jesus on this weblog. Seeing Jesus appearing as no 1 on Steven’s list however gives some comfort. This namely gives some indication that it really is an important question for many people whether Jesus has existed or not. The author presents some scientific innovations that meet with unwarranted opposition or neglect by fellow scientists. Local conditions in Holland are relevant since those affect direct communication. Discussion of this case might inspire an overall improvement in politeness and competence. A key insight for readers: it is advisable to ask questions first. Consider the problem first in abstract manner and then concretely. (1) Abstractly: In the advancement of science it happens that researcher A has a new idea and tells researcher B about it. Since B did not launch the idea, and need not quite know what it entails, it is B’s role to ask questions first. Asking questions is not only polite and nice but basically part of scientific competence. The answers to those questions might cause A to retract the idea or B to accept it. It might be that B has been working on the same issue and feels that it isn’t necessary to ask questions. Still, it is useful to verify common grounds. The proper attitude in science thus is to first ask questions, in particular when you do not understand something. When B quickly rejects a new idea as silly, then science gets stuck in the situation that A has developed a new idea and B has developed a vested interest in calling it silly. The situation would be worse when there wouldn’t be a level playing field when A is a junior researcher and B a senior researcher. The idea gets blocked if the fast rejection by B is the standard attitude, or when other person C refers to B as the main source, with possible misrepresentation as to what the idea actually is. (2) Concretely: The author reports about his experience in doing science in Holland. Holland has the reputation of being tolerant and open-minded but it is better to look at some facts about the country. In the author’s experience researchers in Holland may forget to ask questions and instead jump to rejection when findings contradict some strong convention or deeply held conviction. The maltreatment and scientific incompetence within the Dutch research community means that scientific results get blocked. If Holland had been just a bit nicer and more competent, then those results could have spread easier and the world could have been different. A key issue is the censorship of economic science since 1990 at the Dutch Central Planning Bureau (CPB). The author advises the world to boycott Holland till the censorship of his scientific work at the CPB is lifted.